In the February 2017 issue, the following article appears on the last page. I do understand that this spot is intended to be light-hearted, maybe even ironic. However, the humour (if that is what was intended) is sadly misplaced. 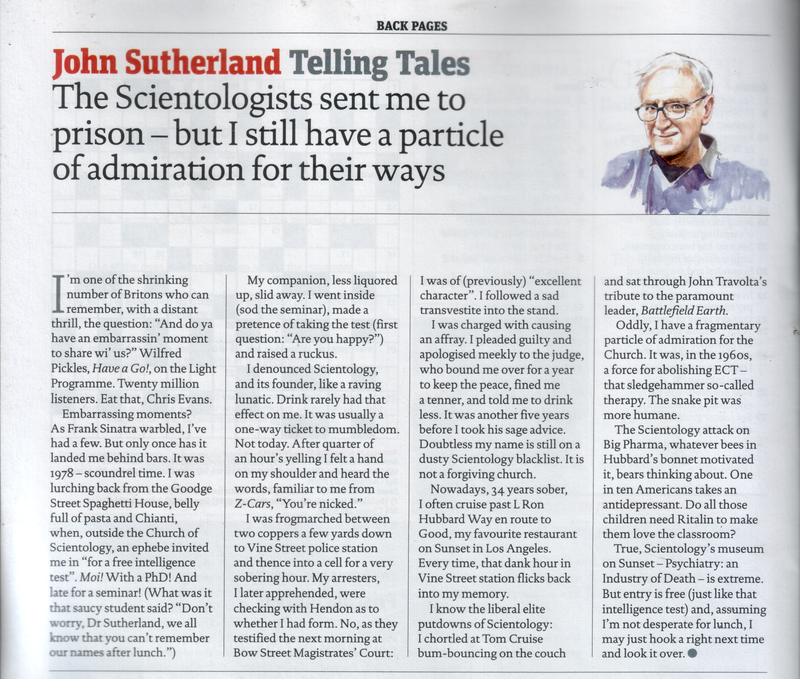 OK… the writer once got blind drunk (in passing… his PhD seems to have given him an inflated sense of his own importance) took a “free intelligence text’, then abused the Scientologists administering it to such an extent that he got himself arrested. I know the liberal elite putdowns of Scientology: I chortled at Tom Cruise bum-bouncing on the couch and sat through John Travolta’s tribute to the paramount leader Battlefield Earth. Oddly, I have a fragmentary particle of admiration for the Church. It was, in the 1960s, a force for abolishing ECT – that sledgehammer so-called therapy. The snake pit was more humane. The Scientology attack on Big Pharma, whatever bees in Hubbard’s bonnet motivated it, bears thinking about. One in ten Americans takes an antidepressant. Do all those Children need Ritalin to make them love the classroom? True, Scientology’s museum on Sunset – Psychiatry: an industry of Death – is extreme. But entry is free (just like that intelligence test) and, assuming I’m not desperate for lunch. Let’s take this passage a piece at a time. Yes – Tom Cruise’s antics on “Oprah” were amusing (although this is not the kind of television that you expect “the liberal elite” to be watching) and “Battlefield Earth” was undoubtedly one the worst films ever made. Those jokes have been done. The fact that people delay presenting to a real doctor causes unnecessary suffering – and sometimes allowing a disease to advance so severely that it is inoperable. The effect this utterly inflexible policy has on people who are a danger to themselves and others – for example Jeremy Perkins. His mother, Elli, deprived him of medication for Schizophrenia after he was definitively diagnosed as suffering from the disease. She did so on the orders of her Scientology ‘superiors’. In the grip of serious delusions, Jeremy stabbed his mother to death – and Scientologists worked hard to cover up their involvement. There are many more abuses, but these are surely enough to be going on with. It’s incredibly superficial to dismiss concerns about Scientology’s behaviour as confined to an effete ‘liberal elite’ snickering at the eccentric behaviour of celebrities. The rest of the passage reads like Scientology propaganda. The fact is the Church of Scientology operates through an anti-psychiatry front group called the “Citizens Commission for Human Rights” (CCHR). This organisation is wholly owned and operated by the Church of Scientology International. It’s purpose is not to address controversial psychiatric treatments, or expose medical abuses. It’s fixed aim is to dismantle psychiatry as a profession, and replace it with Scientology. The ends, they believe, justify the means. This is based on the Scientology doctrine that Psychiatrists are reincarnations of beings from the planet Farsec (the villainous ‘Psychlos’ in that terrible film “Battlefield Earth”, in fact). These entities are engaged in a conspiracy to implant their patients with false memories to prevent them taking up Scientology and liberating the world. 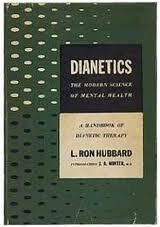 More mundane critics will maintain that, when L Ron Hubbard published “Dianetics: The Modern Science of Mental Health” in 1950 he expected to be hailed as a genius. His collaborator, John W Campbell, who heavily promoted Scientology in the pages of his magazine “Astounding Science Fiction” confidently predicted to his astonished writers that Hubbard would win a Nobel Prize. in fact, academic journals concerned with psychology rejected his submissions, and reviews of his book by the professions dismissed it as the barely coherent pseudo-science that is was. To top it all, shortly afterwards, dianetics practitioners were convicted of practising medicine without a licence. Hubbard responded by attacking psychiatry (and to a lesser extent, medicine) at every opportunity. He asserted that the profession was trying to suppress dianetics because they know that they could not compete with it . The elaborate conspiracy theory he constructed upon this base also functioned to provide an alibi for many of the failures of dianetics and Scientology – they were actually due to the worldwide plotting of evil ‘psychs’. That’s not having “[…] bees in your bonnet” – that’s a vendetta. Psychiatry, and the medicinal drug industry are far from perfect – but is incredibly naive for the author of the “New Statesman” article to pretend that the Church of Scientology is conscientiously working (through a front group which does not mention Scientology) to expose those shortcomings and improve medicine. It isactually working to dismantle medicine by any means necessary, and replace it with psychiatry. One in ten Americans takes an antidepressant. Do all those Children need Ritalin to make them love the classroom? The ‘one in ten’ claim is unsupported, and the line ‘all those Children’ taking Ritalin isn’t even quantified. This is the kind of unsupported assertion you would expect to come from CCHR, not a journalist (albeit one who is relegated to the ‘funnies page’). This is an exhibition which seriously asserts that the Nazi Holocaust was conceived, organised and undertaken by psychiatrists and members of the public typically perceive it as unbalanced hate speech. Perhaps if the writer gets around to a visit, he will decide that he has “[…] a particle of admiration” for that, too. The CCHR is very good at anti-psychiatric propaganda. It often fools the press into thinking that it is a genuine watchdog organisation. Local newspapers, starved of advertising income by the Internet, can be excused for occasionally falling the this ploy (as the Lincolnshire Echo did, in August 2015). 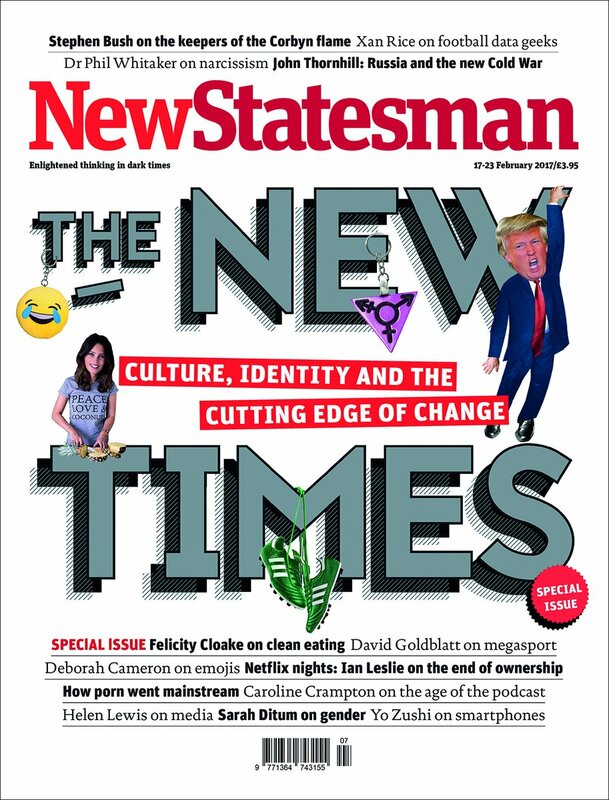 The”New Statesman” really ought be above that kind of mistake. I suppose that, as a last resort, the magazine’s editor might argue that the article in question was humorous, or intended to be ironic. It wasn’t. It was ill-informed, condescending and not actually funny. Either that, or they just don’t get Scientology. This proposition is supported the fact that they have disastrously misjudged the ‘church’ at least once before. Click on the image to see a larger version in a new tab. When the Alex Gibney documentary film, “Going Clear” was about to shown in the UK, the Church of Scientology took out a number of press advertisements and billboards promoting their ‘social improvement’ front groups. 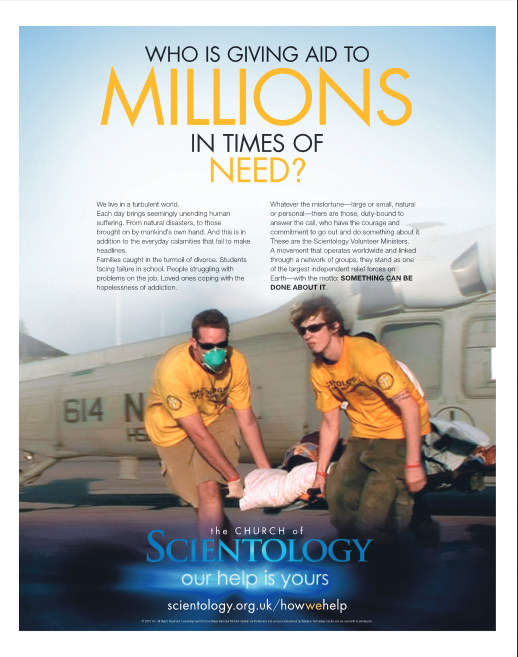 The “New Statesman” carried a advertisement for the activities of Scientology ‘volunteer ministers’. The ASA agreed that there was no comparison between VMs and real disaster relief organisations, as suggested by the advertisement, which was rule to be misleading. The Church of Scientology was ordered not to make that claim again, and were sanctioned on the ASA website. If the “New Statesman” had bothered to properly vet its advertisements, or had any knowledge of the activities of the Church of Scientology and its front groups, they would surely have rejected this grossly misleading copy.